RIDGEFIELD PARK, N.J. – January 3, 2013 – Samsung Electronics Co., Ltd, a global leader in digital media and convergence technologies, today announced the launch of the NX300, the new flagship model in its successful NX series. The NX300 once again raises the bar for compact system cameras (CSC), delivering an outstanding combination of features, functionality and style for perfect shooting in every moment. Samsung also announced the new NX 45mm F1.8 2D/3D lens, the first one-lens 3D system capable of capturing both still images and full HD movies in perfect 3D quality. Myoung Sup Han, Senior Vice President and Head of the Digital Imaging Business, Samsung Electronics, commented: "Since its launch in 2010, the Samsung NX System has become synonymous with innovation and design, making the best digital imaging technology available to everyone without compromising on style. The NX300 builds even further on this illustrious heritage. Not only does it deliver incredible speed and accuracy through advanced photographic features, but it is truly built around the user, with upgraded SMART Camera functions making shooting and sharing both easy and seamless. We are also very proud to introduce the first one-lens 3D system alongside the NX300, opening up a whole new world of 3D photography and video recording for consumers everywhere." Central to the NX300's outstanding imaging performance is its brand new 20.3 Megapixel APS-CMOS sensor, capable of capturing high quality detailed. Images boast sharp, life-like colors and are crisp and clear in all light conditions. The wide ISO range (ISO100-25600) further improves performance, letting users capture beautifully balanced images in even the darkest conditions. A brand new Hybrid Auto Focus (AF) system also delivers fast, accurate phase and contrast detection, while the 1/6000 sec shutter speed and 8.6fps continuous shooting mode ensure you never miss a moment. The Samsung's unique in-house developed DRIMe IV imaging engine provides outstanding developments in speed, and image quality. The DRIMe IV engine enables better color reproduction and greater noise reduction, as well as support for full 1080p HD video capture in both 2D and 3D (when combined with Samsung's new 45mm 2D/3D lens). The NX300's 84mm (3.31") AMOLED screen makes capturing and reviewing your images a pleasure, while the hybrid touch screen and 5-way manual key interface is simple and intuitive to use. The tilt display makes it easier than ever to take high and low angle shots, letting you capture your world from any angle you choose. The compact NX300 makes it simple for anyone to achieve pro-like and impressive pictures easily with minimal technical knowledge or time spent adjusting parameters. Using the camera's Smart Mode, users can choose from 14 different settings, such as Creative Shot, Landscape, Light Trace or Action Freeze which will automatically adjust parameters such as aperture and shutter speed in order to obtain the best shot possible for the desired situation. The NX300 also includes i-Depth, an easy and simple way to adjust the depth of an image using the NX Series' unique i-Function system which enables users to modify camera parameters using the lens itself, adjusting the image without ever having to move off target. The NX acclaimed design returns with the NX300 sporting a stylish yet simple retro feel that is available in either black or white with a contrast silver band, conveying elegance and authenticity. The NX300's Wi-Fi connectivity of SMART CAMERA allows users to share their cherished photos instantly and securely between their camera and smartphone (or tablet). To connect a smartphone to the camera, users simply need to download the Samsung SMART CAMERA App., which is available for both Android and iOS based application markets, onto their smartphone or tablet and follow the easy steps to create a secure connection with the camera. The NX300 will be able to detect and auto-connect to the smartphone wirelessly whenever any of the SMART CAMERA features are activated. These include AutoShare; which automatically sends every high-quality photos to your smart phone for safe keeping, and Mobile Link; which allows users to select and transfer images or album from the camera directly to your smartphone at their leisure. The SMART CAMERA App. also features a Remote Viewfinder function for the NX300, allowing for even more inventive and exciting photography. The NX300's enhanced Wi-Fi connectivity also lets users share images with friends and family directly from the camera via social networking sites using the cameras one-touch DIRECT LINK hot key. Alternatively, images can be automatically backed up or stored in the cloud through AllShare Play ensuring they are always safe and easily accessible. The Samsung 45mm 2D/3D lens(sold separately) opens up an exciting world of 3D imaging possibilities and is the world's first one-lens 3D system for a consumer camera. Capable of capturing both still pictures and full 1080p HD video, the Samsung NX300 and 45mm 2D/3D lens kit have become the only compact system camera supporting both 3D still and 3D movie. The NX300 is also compatible with Samsung's entire range of NX lenses and professional standard accessories, giving users an unparalleled range of options when striving for that perfect shot. Please visit our booth to experience this future technology firsthand. Samsung's product line will be displayed January 8-11 at booth #12004 in the Central Hall of the Las Vegas Convention Center. Full details, video content and product images are available at the Samsung microsite at: Samsung CES 2013 or mobile site at: Digital Video News, Reviews and Forums at DVInfo.net as well. The Samsung press conference and Samsung Tomorrow TV CES 2013 Specials will be streamed live on the Samsung Tomorrow blog at: SAMSUNG TOMORROW / Samsung Electronics Official Global Blog and Samsung's microsite site also. Samsung Electronics Co., Ltd. is a global leader in consumer electronics and the core components that go into them. Through relentless innovation and discovery, we are transforming the worlds of televisions, smartphones, personal computers, printers, cameras, home appliances, medical devices, semiconductors and LED solutions. We employ 227,000 people across 75 countries with annual sales exceeding US$143 billion. Our goal is opening new possibilities for people everywhere. To discover more, please visit Samsung US | TVs ? Tablets ? Smartphones ? Cameras ? Laptops ? Refrigerators. This is just my theory based on preliminary specs, but it sounds like it might be a plenoptic camera (a.k.a. light field camera) when the lens is in "3D" mode and include built-in software to process the micro-lens data into stereoscopic 3D. I've been researching this technology for a long time but the only one to come to market so far has been the Lytro. The fact that the Samsung camera's 2D images are 20MP but the 3D images are only 4MP suggests a micro-lens plenoptic configuration. Interesting... if my assumption is correct. I won't be at CES this year. Anyone else going who can visit this camera at the Samsung booth? I found a pic of the lens. 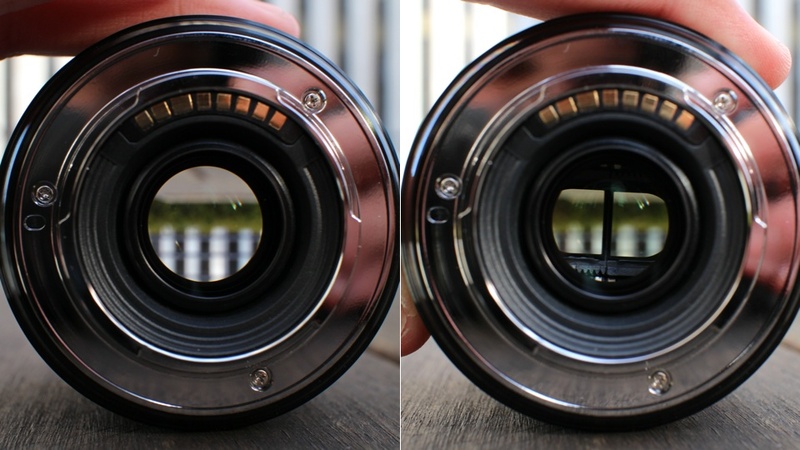 It looks like it does have a drop-in microlens, but it is only two segments. it is written that: "This is achieved by employing two LCD shutters that swing into the optical path when the lens is switched to 3D mode, a design reminiscent of one announced several years ago by Canadian firm ISee3D, although we understand that Samsung has developed its system in-house." If, for example, the left part of the pucture is taken on the left (right) part of the sensor and vice versa, and if aspect ratio of the picture is kept unchanged, only 1/4 of the sensor surface is covered by left (or right) picture. When adding some horizontal (and slight vertical) croppings of the pictures for aligning stereoscopic window and depth, you probably get about 1/5 of the sensor surface. 20M/5 = 4M. OK. This is only speculation. It it is true then highly synchronous pictures would not be possible as well as we would get some more noise in 3D mode, since only half (or even less) of the lens area would be "active" during taking the picture. If the footage is really from that lens, it is not suitable for moving objects (as predicted). See her moving her hands at about 10s. I think that's just a very short shutter, but maybe that is required if the shutter method is actually used as suggested. The temporal sync seems to be perfect. Perfect? Have you seen the clip? Anyway, up to now the (bad) results are perfectly in accordance with physics (when taken into account the working principle). I would be very surprised if they would get much better synch on the final product (in all circumstances). This camera could be a very interesting development in 3D photography in that it employs such a small form factor so it could be a crash cam or off-angle B or C cam on shoots. The slowness of the lens (f3.5) in 3D mode is not so bad given the large sensor size and it's inherent low light capabilities, but the almost 2X crop factor makes it a telephoto lens. I'm curious as to whether it is only a side-by-side half resolution recording or a MVC type R/L Delta frame recording which might get you to full resolution with some finessing in post. It appears that it is the former, but would be very nice if the latter. And speaking of post, is there any info on a post production workflow, or is it just designed to feed Samsung 3D TV's from the camera body? The music video itself would indicate that the footage is somehow editable. I watched several of these clips and have to agree with Damir, seems to be temporal offset. When I freeze the "Baby" clip, I can see that the position of the baby's feet when she is kicking quickly, is different in the left and right eyes. I HOPE this is a beta issue - had great hopes for this thing! When I watched it on YouTube the first time on my passive 3DTV I didn't notice any temporal issues, but there are moments that are apparent when paused. The concept still has potential if they can get the shutter switchover to happen faster, but it may not be possible with LCD. This interests me. The root cause of the Pulfrich Effect (Phenomenology of Motion) is that horizontal motion in plane perpendicular to the viewer appears moving on z-axis (away or towards) the viewer, if the image in one eye is perceived as delayed, due to darkening it. If then L/R are delayed, the horizontally moving object should be perceived as being misplaced in depth, depending on the delay and direction of the motion. I never experimented with this. Can anyone comment on this? This should be dynamic only phenomena. but do not have a macro range. Maybe this means no macro? And I didn't see mention of how close you can shoot 3D? It sure would be easier to get one lens close to the small subject, than two. Panasonic's CMOS Sensor Enables to Take 3D Video With Single Lens -- Tech-On!